Five more plaques have recently been put up around Lewes, marking buildings with a particularly interesting history or sites where a former use has disappeared. This brings the number of these plaques to 33. These have mostly been a joint venture between the Town Council and the Friends of Lewes, who have undertaken the research. 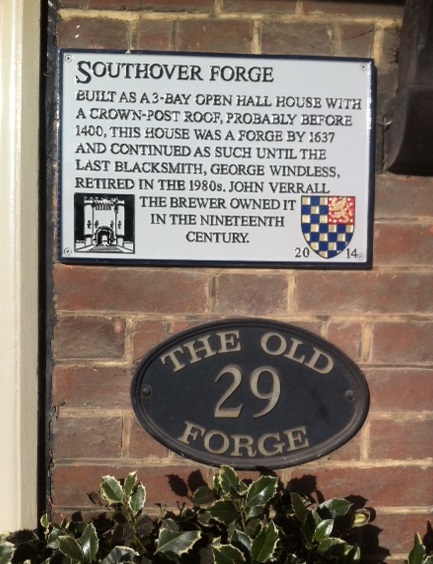 The new ones can be found at the sites of the Odeon Cinema in Cliffe High Street and the Cinema de Luxe on School Hill, on Southover Forge (see below), the sculptural panels above the entrance to County Hall by William Mitchell and one to celebrate the many clockmakers in Lewes in the 18th century. The January 2015 list of plaques has now been superseded.